(Compiled from articles at LifeSiteNews and NJ.com) — It’s hard to say you don’t have a clear choice this presidential election year. The Democratic and Republican platforms show views of world 180 degrees apart. They reflect the stark divide between the parties. At 55 pages, the Democratic document is 11 pages shorter than the GOP platform and mentioned Trump 29 times compared with just one of Clinton in the Republican document. Priests for Life released a side-by-side comparison of the Republican and Democratic party platforms that shows stark differences [between the parties] when it comes to the rights of the unborn, religious liberty, marriage and the family and respect for the U.S. Constitution. “We talk about voting with a clear conscience, which means you can’t vote against your values,” said Father Frank Pavone, National Director of Priests for Life. “But to vote with a clear conscience, one must consider that elections not only put individual candidates into power; they put political parties into power. “The same questions you ask about the candidates’ positions on issues have to be asked of the party’s positions. The party platform expresses its philosophy, and its policy preferences. If that party comes into power, what people will they assign to committees, and what bills will they allow to come for a vote? What type of people will be in the administration and on the staff of the elected official; what kind of appointments will that individual make? “Even if an individual candidate is weak on a particular issue, the party platform signals the direction in which he or she will be guided and influenced by staff and advisers, and by constituents. And in the case of a President, the party platform gives a clear signal of the type of philosophy that will prevail, under that President, at the Department of Health and Human Services, at the Department of Justice, in the Surgeon General’s office, in the federal courts, in the Supreme Court, and in thousands of other positions in many federal agencies. Compiled from articles published at LifeSiteNews.com and NJ.com. 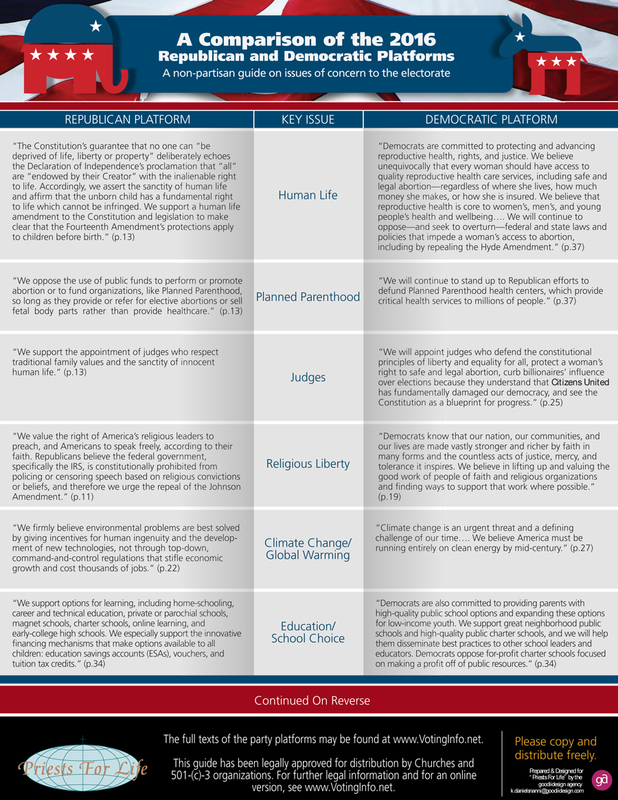 Visit the Priests for Life PoliticalResponsibilityCenter page for a link to their platform comparison chart. Click here for a pdf version of the chart below.